Doc Porter’s called out as a top date spot in Charlotte! Cary Magazine reviews Doc Porter’s bourbon. Food and cocktail blogger Jess, comes in for a behind-the-bottle tour at Doc Porter's and checks out our grain-to-glass products. Couples who cocktail feature from SouthPark Magazine. SouthPark Magazine features Andrew & Liz's home bar and take a look at life outside the distillery. Bob Peter's of the Punch Room at the Ritz-Carlton talks Garden-to-Glass Doc Porter's Cocktails. Bob Peter's of the Punch Room at the Ritz-Carlton whips up a seriously incredible Doc Porter's Bloody Mary. Andrew's interview with Taste the Dram's Gene Kizhnerman. The Scout Guide features Doc Porter's Bourbon in their spin on a classic Old Fashioned. Check out what our barrels are up to once they're done aging our Doc Porter's Bourbon. 10 holiday gifts for Charlotte dudes made by Charlotte dudes. Charlotte Five introduces Doc Porter's Bourbon. CraftCarolina.com highlights Doc Porter's new products and what's to come. Style Bluprint features Doc Porter's Gin as a "Distinctly Southern" spirit to include in your cocktail. Andrew & Liz Porter make SouthPark Magazine's list of 10 people in Charlotte shaking up the cocktail scene. Andrew & Liz Porter make SouthPark Magazine's list of 10 people in Charlotte Raising the Bar on the drink scene. Doc Porter's is the September/ October pick for Epicurean Charlotte's Drinks with Kate feature. Mixologist, Bob Peters, showcases Doc Porter's Gin in the Doc's Cantaloupe Cooler. Using ingredients from the Ritz-Carlton's rooftop garden, he crafts the perfect summer cocktail. Owner and head distiller, Andrew Porter talks to WFAE's David Boraks about the pros and cons of a bill that could help NC distillers. Bob Peter's mixes up his new summer punch using Doc Porter's Gin. Watch the clip for the recipe or stop by The Punch Room at the Ritz-Carlton for a taste! Writer, Blake Miller, profiles Doc Porter's and previews the newly released Gin. Charlotte Agenda's Katie Levans pays the distillery a visit and previews the new Doc Porter's Gin! Nikki Wolf from Yelp Charlotte talks drinking local and, of course, Drinking Docs. Go Carolinas stopped by for a tour and tasting. Read about their visit. Owner and head distiller, Andrew Porter, chats with Mike Collins on Charlotte Talks. Doc Porters is featured in Charlotte Magazine's article Return of Hooch in North Carolina. We hung out with Wilson from Charlotte's CW and took him behind-the-scenes of making great craft spirits from scratch. Write Jeff Lipsack and photographer Jamey Price created a beautiful Doc Porter's feature in QC Exclusive's 2016 Jan/ Feb issue (Vol. 5, No. 1). Katie Levans from Charlotte Agenda features Doc Porter’s in a segment about food trends on the rise on WCNC's Charlotte Today. Carolina Bride featured Doc Porter’s as the “Perfect Pairing” for North Carolina weddings in their 25th Anniversary edition. Thanks to the amazing Bob Peters of The Punch Room for formulating a fantastic cocktail for the story. Look for Carolina Bride's 25th Anniversary edition on stands. Elite Yelpers came out for Yelp Charlotte’s #YelpShopsLocal Meet the Maker event at Doc Porter’s. Check out their reviews and pics. Creative Loafing Charlotte explores new sales laws for NC distillers. Oh…and we made the cover- SCORE! The CharlotteFive tells you everything you need to know about our opening and gives our vodka a great, smooth review. Ted Williams stops by to tour and taste at Doc Porter’s prior to the 11/6/15 opening! We talked distilling, Doc Porter’s, and drank some great beers with the crew at Cheers Charlotte. 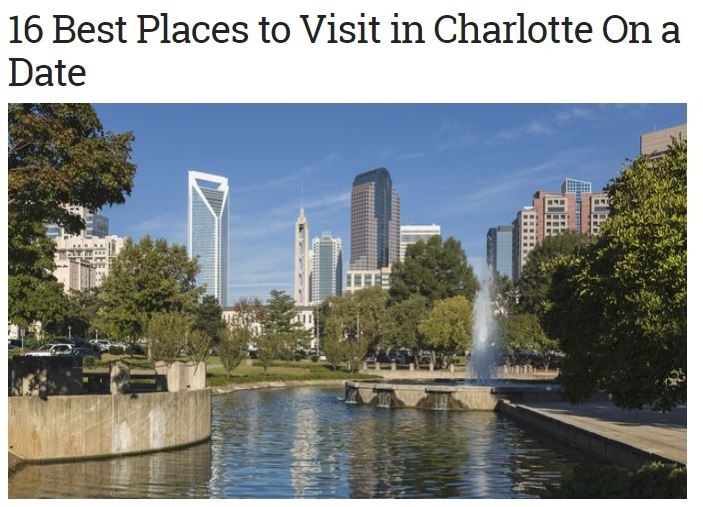 Doc Porter’s opening is featured in the Charlotte Observer.